Jonathan Williams and Andrew Meadows review the history of the various currencies that were replaced by the Euro. For Frank, Mark, Drachma, Lira... read Euro. On October 28th,1971, a motion carried in the House of Commons launched Britain into its turbulent membership of the European Economic Community, or the Common Market as it was often called. Amid the acrimonious debate that had preceded the vote, the Bank of England had begun the issue of a new £5 note. On the back was featured the Duke of Wellington and a vignette of English soldiers fighting the French. The new note may not have been directly inspired by the events of the day. Nevertheless, currency and its designs can be revealing symbols of national aspirations. 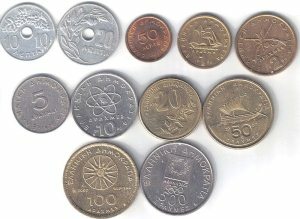 As tangible, everyday objects coins and banknotes also act like no other medium to separate the citizens of one state from those of another. The French are not the only nation that speaks French, but they have been the only one in Europe to use the French franc.